To be a leading service provider in the Tourism Industry renown for creativity, professionalism and care. This is the mission of Envoy Hostel and Tours as a company. Thus, being faithful to its mission Envoy hostel has initiated a loyalty discount project. All guests who stay at Envoy Yerevan Tbilisi receive 5% discount at Envoy Yerevan hostel, and vice versa. 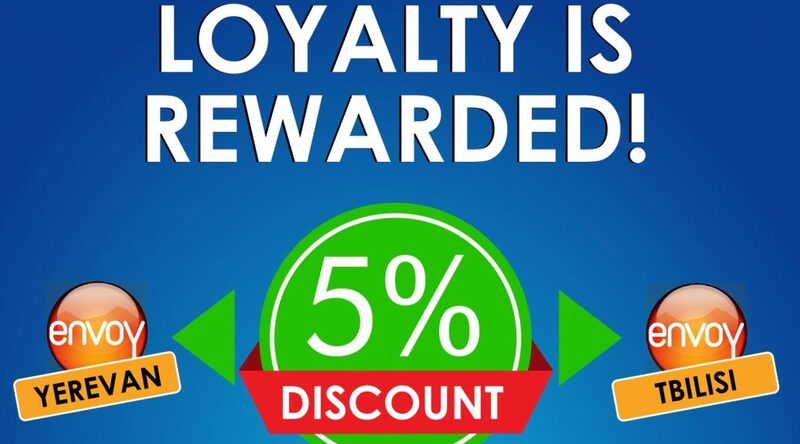 The loyalty discount aims to provide better travelling opportunities to our guests and help them create fantastic memories. When travelling, every little bit of saving helps. Saving translates to travelling further and seeing even more! Its not easy to reach our parts of the world so while you are in our region we encourage you to take this opportunity to combine two trips connecting Armenia and Georgia. Two small, yet amazing countries with very different culture, history and traditions! Oh, and lets not forget about the food! Both Georgia and Armenia have much to show in terms of sights and guarantee to delight their guests. Book direct for loyalty discount! Booking direct means you support the small local businesses (rather than the giant Online Travel Agents which take commissions). So to encourage everyone to support local businesses, the loyalty discount is available ONLY if you book direct through our website. Once you book, you will receive a PROMO-CODE to receive the discount at your next envoy destination! Its as easy as that! Just a reminder that all Envoy Hostel guests receive discounted rates on Envoy Tours too! This means more value for your money for choosing to stay at Envoy Hostels. Previous PostCo-working space – your Office at Envoy Phnom PenhNext PostMonti the Traveller!